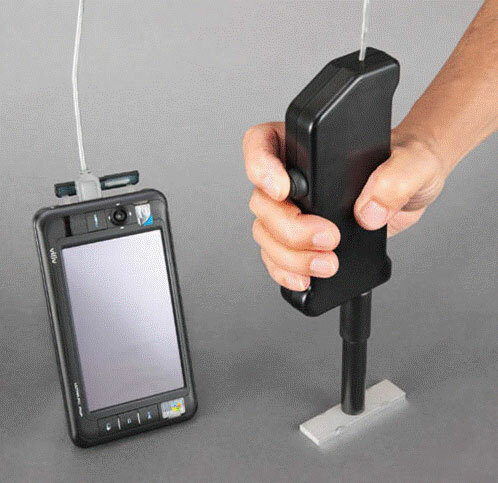 This is an innovative tool of coverage rate measurement following shot peening peening or sanding. As a professional in impact surface treatment solutions, SONATS is the exclusive distributor in Europe of the Toyo Seiko Coverage Checker™ (Japan). Coverage rate is a primary criterion for the fatigue resistance and the stress corrosion resistance of treated metal parts. The current standard recommends the use of a 10-30x magnifying glass to inspect the coverage rate. This method is very subjective and results vary according to the experience of the operator and the quality of the lighting. Evaluation can also be very complicated when the required coverage rate approaches 100%, or when the operator is examining different types of intensities, or when the geometry of the part makes the inspection difficult (threads or springs). Toyo Seiko has specifically developed an innovative piece of equipment that allows automatic and repeatable measurement, both upstream, during the set-up phase of shot peening applications, and downstream, during production controls. The calibration of the equipment is based on a visual inspection. It is necessary to repeat the calibration for each type of part inspected to create a recipe associated with a particular measurement type. This calibration is performed using representative strips with variable coverage rate measurements. Measures any type of geometry: convex or concave surfaces, springs, bores etc.